The clean eating brand is planning to steal the show with their irresistibly crunchy, perfectly seasoned creations. Snack like you've never snacked on before. With snack mixes that feature green bananas, mouthwatering spices, and real-food ingredients, you can snack all you want without all the guilt. Join Bubba’s Fine Foods at the 2019 Fancy Food Show from January 13-15 to get a taste of what the future holds for Paleo snacking, Booth #6476. Presented by Specialty Food Association, the 2019 Winter Fancy Food Show is the premier event for discovering the next big food trends with thousands of new products, 1,400+ exhibitors, and network with the industry's leaders. 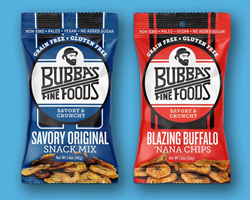 Bubba’s Fine Foods will have their diverse line of gluten-free, grain-free, paleo snacks on display, giving spectators, retailers, and more the opportunity to try healthy alternatives designed for real people with real taste buds. The Sports Fan -- Filled with pecans, cashews, and dried green bananas and liberally zested with scintillating spices, their Snack Mixes easily take the place of other guilt-inducing, savory game day favorites. Flavors include Savory Original, Righteous Ranch, and Smoky Chipotle BBQ. The Athlete -- Whether hitting the trail, the gym, or the soccer field, their kettle cooked ‘Nana Chips offer a spice-centered pick-me-up and addictive crunch without the banana flavor. Options include Blazing Buffalo, Grand Garlic Parm, and Macho Nacho. The Everyman and Woman -- For an oat free, low-glycemic treat, check out their UnGranolas. Almonds, coconut flakes, and cashews give a satisfying crunch and protein boost to yogurt, cereal, or straight from bag to mouth. Flavors include Bourbon Vanilla, Uber Chocolate, and Cinn-Ful Apple. All of Bubba’s Fine Foods are proudly made in America in the heart of Loveland, Colorado, and are paleo, grain-free, gluten-free, soy-free, dairy-free, non-GMO, and free of refined sugars and artificial flavorings. Available for purchase at http://www.bubbasfoods.com, Amazon, Natural Grocers, Sprouts, Whole Foods, The Fresh Market, King Soopers, and more in select retailers across the nation. To learn more about Bubba’s Fine Foods, stop by Booth #6476 at the Winter Fancy Food Show, Moscone Center, San Francisco, January 13-15, 2019. To coordinate an interview with Bubba’s Fine Foods, contact Brooke Daily at brooke(at)veteranpr(dot)com. 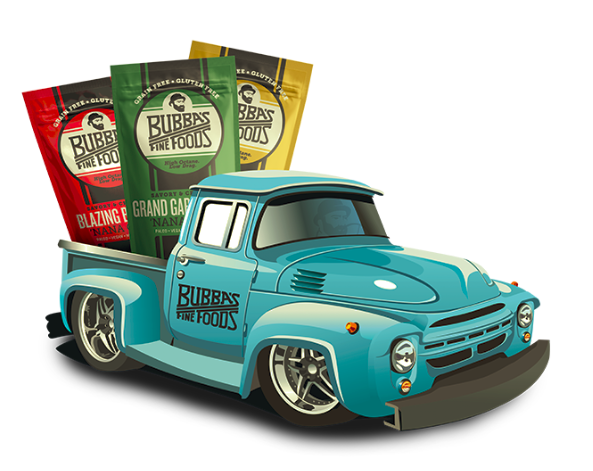 Since 2014, Bubba’s Fine Foods has been at the head of a natural health food revolution with crunchy, real food snacks boasting addictive flavors. The company is run by gourmet chef Jared Menzel and health coach and former CrossFit trainer Jeff Schmidgall, brothers-in-law with a passion for placing the health of their consumers at the top of their priority list.